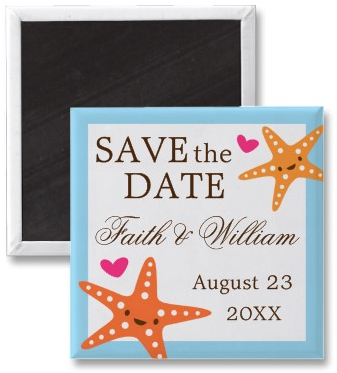 Super cute, personalized wedding Save the Date magnet featuring two kawaii style, orange starfish with pink hearts and a blue border around the brown text. Customizable names and wedding date. Great for beach and sea themed weddings. Available from Zazzle. Click on the image for details. This entry was posted in Save the Date, Save the Date magnets, WEDDINGS and tagged Custom save the date magnets, Cute save the date magnets, Cute save the dates, Personalized save the date magnets, Unique save the date magnets, Wedding save the date magnets. Bookmark the permalink.